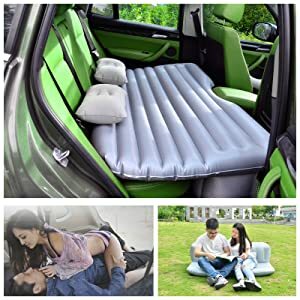 Inflatable car mattress is a great supplement for people who are always on the go. If you like camping, hiking and other sorts of stuff which involve traveling, it may be very uneconomical to pay hotel fees every time you travel. That’s where the inflatable car mattress comes into the game. People always complain about not getting enough sleep when on camping. This thing not only gives you a comfortable sleep but it’s very economical too. 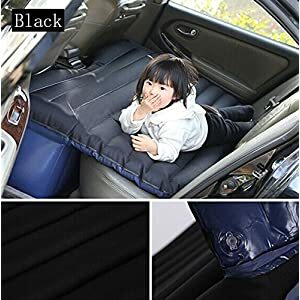 How does the Inflatable Car Mattress work? Buyers Guide: How to choose the perfect inflatable car bed? The way it works is very simple. It comes with an automatic pump which will help you inflate and deflate it according to your own needs. There is a wide range of models available in this category. There are different sizes, colors, shapes, and prices to choose from. It fits on the backseats of most cars and SUVs (Sports utility vehicle). It is made from a very lightweight material so it occupies less much space after folding. Before you buy any mattress, you need to be aware of what the perfect mattress for you would be. Below are some points which will help you to decide that which mattress you need, consisting of all those features you require. This is directly related to the number of users of bed at one time. If there are two users then the double height airbed would be ideal as it lasts longer before deflating. If only you intend to use it then any general mattress would be more than fine. Knowing the time of the airbed before it completely deflates is also essential as it corresponds to your sleep timings. Again, the size is determined by the number of users using the bed at the same time. However, if you are the sort of person who always turns sides and rolls too much then a bigger size for you may be required. Size is directly proportional to the price of the mattress. The more the size, more the price. It is also essential to check the weight capacity of the mattress, especially if more than one person is going to use it at once. Buying a good quality mattress can last a lifetime, that’s why it is essential to look for a mattress that is a reliable brand as well as reliable quality. High-quality material will not only last long but will also provide great satisfaction. Spending some bucks on this may save you money later. Many types of materials have some type of odor. It may be due to the nature of the material itself or due to the industrial processes through which the mattress forms. Mostly Odor is not that disturbing but if you are allergic to any type of smell or material then be sure to avoid it and go with the best material available rather than some bad-quality ones. Everyone has a little doubt on things that are being sold online because we can only see them after payment is made. If the mattress you ordered was not your type or anything goes wrong then you can only change or return it if you were guaranteed with money back or if the product has a warranty. So, after deciding that which one you like, go through the description of the product to see if there is a warranty of the product. However, a huge number of online retailers have perfect money back mechanism but a warranty will always provide you an edge. 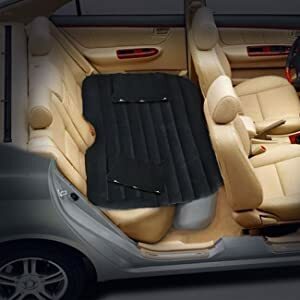 This is a multifunctional inflatable car air mattress that is made from a high-quality material. Waterproofing along with environment-friendly characteristics make it more reliable. The material is soft enough to provide you a good level of comfort, hence a solid sleep. The bed has two separate parts which are divided and you can inflate them up separately. Inflation volume is solely attributed to the needs of the user. The load of the product itself is 5.6 Pounds. Its dimensions are 15.9 * 9.7 * 5.8. This is one the best mattress for camping. This is fully compatible and builds for most SUVs so you can enjoy a full car camping to a great extent. This mattress is not made up of low quality but is highly durable. Anybody, whether it’s adults or kids, everyone will be able to retrieve a peaceful sleep from this mattress. One of its greatest features is that has some of the cold resistant functions. They come handy when you don’t want your car fuel to be used up by the heater from dusk till dawn. Its width is 50 inches, length 70 inches, and height is 2 inches. The package weight of this product in the condition of arrival is 9.8 pounds. It is expensive but totally worth it. This mattress gives the user a feeling of being in a mobile bedroom due to its space and other great characteristics. It is compatible with many of the travel cars, even if your car is not an SUV, it will still work. Its high-quality PVC material not only provides great comfort but the flexibility and easy-deflation features make it very portable. 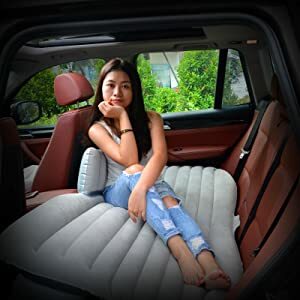 The packaging of this product includes one air mattress, one pump to fill the air (attaches to the car) and two car air pillows so you can have the best experience. The length of this product is 9.8 inches, width is 8.6 inches, and height is 3.9 inches. We indeed have to say that this is made from a very high-quality material due to its comfort zone. 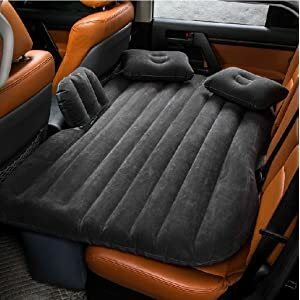 Campers would love it as well as it makes one of the best back seat couches in this category. An automated inflator will be provided along with two inflatable pillows, one repair kit as well as with one storage bag too. Imagine you are on a camping trip and suddenly a sharp screw in the car door bursts the mattress. This is where repair kit comes to save the day. Specially designed bandages can restore your fun in a matter of seconds. This itself signifies that company has made a good effort to make their bags as durable as possible. The length of the mattress itself is 143cm, width is not more than 87cm, and maximum height is 45cm which can be always adjusted to suit your comfort level. The packaging weight of the product is 2.69KG. 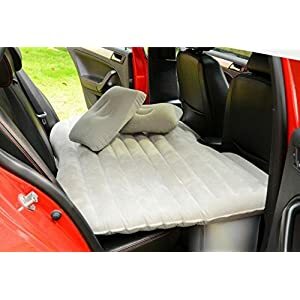 This air mattress has a good compatibility with every vehicle, whether it’s a car, jeep or SUV. Even Mid-Sized trucks come under its hood. Its design and quality fascinated us a lot. It has two equal, separated parts which have to be blown separately. It consists of lightweight material so it should not be a problem to carry it about. However, the time after inflation is required is a little bit low for this unit. This requires inflation after about 10 hours of use. Sharp object too should not be brought closer to it. The product packaging weight along with the mattress is 5.3 pounds. Its length is 135cm, width is 85cm and height is 45cm. As you may have judged it from its name, this is the mattress that is specially designed for people who care a lot about sleep. That is why thick PVC was used in its making so maximum comfort can be provided to the user. 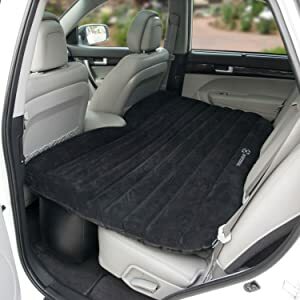 However, the size of the unit is small when being compared to its competitors As with others, pillows come with this which always comes handy. It is compatible with most cars, mid-sized trucks, and SUVs. These products dimensions are 54 inches in the length. 36 inches wide and 8 inches is its height. The shipping weight of this product is 5.2 pounds. The unit is really soft and comfortable but tough enough to last a whole lifetime. The automated pump makes it easier for you to adjust to the inflation pressure of the mattress as subjected to your needs. This mattress also has separate sections so it can fit different types of vehicles. The cold in the night would not disturb you after you purchase this neither the water can make it. The product dimensions are 5.8 inches in height, 11.8 at width and 18.4 at the length. The packaging weight contains about 7 pounds in it. It comes with a glue kit so your romantic trip does not end due to a bad quality mattress. This is one of the softest and comfortable air mattresses as it is made from thick velvet cloth. Furthermore, the PVC material enhances its durability. One thing which we liked the most is that it contains shock-resistant features as well as it is moisture resistant. This mattress has a good size and it can easily handle at the same time. Its values are too regarded as leak proof which means that the time after it automatically deflates is lesser than another mattress. However, due to leak-proof valves, it may mean that you may face some little difficulty when inflating the mattress at some hard-to-reach points. The shipping weight is 5.85 pounds. Its dimensions are 6 inches in height, 11.8 at the width and 13.5 at the length. 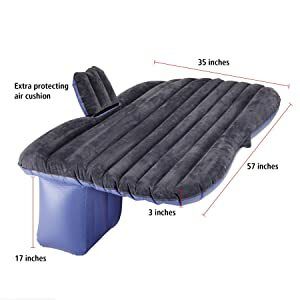 This airbed is specially made for camping and outdoor activities. It will ideally fit in the back of your car. 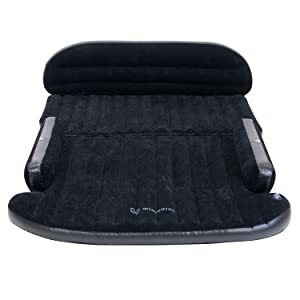 It comes with 2 carbon fiber grey pillows and is one of the airbeds with a flocked fabric material. It comes with an automated pump and the special thing about it is that it can support till 1 ton of weight. It comes with a repairing kit too as well as a covering bag to put it in for ultimate portability. This is one of the few mattresses that arrive with a 30-Day money back guarantee which means you will have a whole 30 days to examine it. And if you don’t like it, all you have to do is to fill out a little form and ship it along with the mattress. Its dimensions are 54 inches in length, 33.5 inches in width and 18 inches in height. This car is great for SUVs, trucks, and Sedans rather than cars. Oxford material and shock resistant materials are used its preparation. The non-toxic and high-quality material is used in its building which does not leave any type of smell. This mattress may be ideal for people allergic to certain plastic smells. Another thing is that it inflates and deflates very quickly. This is a plus point but on the other hand, it also loses air somewhat quicker than others. It can inflate within 2 minutes when connecting to a 12V car power supply. This unit also arrives with a 30-Day money back guarantee and also with a whole 1-year warranty. So either way, this is a win-win situation. It also has friction resisting features which means its less slippery as compared to the others. It also includes a glue kit and a separate repair kit. Its dimensions are 12.9 inches in length, 11.3 inches in the width and 6.15 inches in the depth or height. The shipping weight of the product as it arrives at your house is 5.5 pounds. 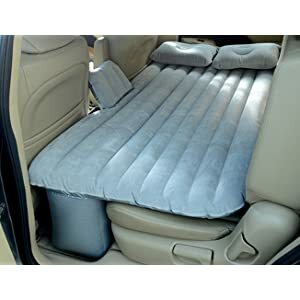 As there are various types of car inflatable air mattress available, which differ in shape, size, color, material, and odor. You should go through all of the information that we have written after carefully going through the details of the mattress. If you want to use it for once or very less, then an inexpensive one might work for you but if you are a camping enthusiast and want to keep using it for an entire lifetime than you need to be careful with your selection. You may choose the one which is not very expensive and gives the balance between the price and its performance. If you are allergic to plastic or certain sorts of smells, then those classified as odor-free by us will work just like normal ones. However, make sure you buy the perfect one for yourself and your loved ones. Happy Camping!